^ 1.00 1.01 1.02 1.03 1.04 1.05 1.06 1.07 1.08 1.09 1.10 1.11 1.12 1.13 1.14 唐德剛. 張其昀, 编. 《中華百科全書·1983年典藏版》. 中國文化大學. ^ CHINA: Return of the Gimo. Time Magazine. 1950-03-13. When China's Nationalists retreated from their refugee capital of Chungking last November, Acting President Li Tsung-jen did not go with them. Instead, Li took a plane to Hong Kong, announced he would enter a hospital for treatment of an old stomach ailment. 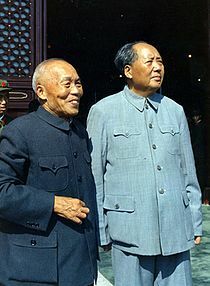 Ever since then, Nationalist China's fight against Communism has been directed by Chiang Kaishek, who came out of retirement to take over unofficially in Li's absence. Li tarried in Hong Kong for two weeks, then came to the U.S. for an operation, bringing his family with him. ^ 6.00 6.01 6.02 6.03 6.04 6.05 6.06 6.07 6.08 6.09 6.10 6.11 6.12 6.13 6.14 6.15 6.16 6.17 6.18 6.19 6.20 6.21 6.22 6.23 6.24 6.25 6.26 6.27 6.28 6.29 6.30 6.31 6.32 6.33 6.34 6.35 6.36 6.37 6.38 6.39 6.40 6.41 6.42 6.43 6.44 6.45 6.46 6.47 6.48 6.49 6.50 6.51 6.52 6.53 6.54 李新總主編，中國社會科學院近代史研究所中華民國史研究室，韓信夫、姜克夫主編 (编). 《中華民國史大事記》. 北京: 中華書局. 2011. ISBN 9787101079982. ^ 白先勇編著. 《父親與民國——白崇禧將軍身影集上冊【戎馬生涯】》. 香港: 天地圖書. ISBN 9789882198111. ^ 傅宁军. 报告文学《吞吐大荒：徐悲鸿寻踪》. 北京: 人民文学出版社. ^ 10.0 10.1 10.2 10.3 “以退為進”：李宗仁競選副總統始末. ^ 11.0 11.1 11.2 11.3 11.4 11.5 11.6 11.7 李守孔. 《中國現代史》. 台北: 三民書局. 1973. ISBN 9571406635. ^ 12.00 12.01 12.02 12.03 12.04 12.05 12.06 12.07 12.08 12.09 12.10 12.11 12.12 12.13 12.14 12.15 12.16 12.17 蔣經國. 〈危急存亡之秋〉. 《風雨中的寧靜》. 台北: 正中書局. 1988. ^ 14.0 14.1 劉維開. 〈1940年代中國國民黨領導階層之分析〉. (编) 呂上芳主編. 《論民國時期領導精英》. 香港: 商務印書館. 2009. ISBN 9789620764264. ^ 15.0 15.1 15.2 15.3 15.4 15.5 呂芳上總策畫，朱文原、周美華、葉惠芬、高素蘭、陳曼華、歐素瑛編輯撰稿. 《中華民國建國百年大事記》. 台北: 國史館. 2012. ISBN 978-986-03-3586-6. ^ 程思遠. 《李宗仁先生晚年》. 北京: 文史資料出版社. 1980. ^ 20.0 20.1 王景弘編譯 (编). 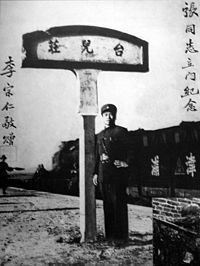 《1949大流亡：美國外交檔案室密錄》. 台北市: 玉山社出版. 2011. ISBN 978-986-294-000-6. ^ 54.00 54.01 54.02 54.03 54.04 54.05 54.06 54.07 54.08 54.09 54.10 54.11 54.12 54.13 54.14 54.15 54.16 54.17 54.18 54.19 54.20 54.21 54.22 54.23 54.24 54.25 54.26 54.27 54.28 《「總統」歸來：毛澤東與李宗仁》. 北京: 中國文史出版社. 2010. ISBN 978-7-5034-2628-5. ^ 56.0 56.1 56.2 56.3 56.4 56.5 劉丕林. 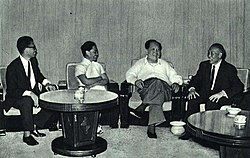 1965年海峡两岸密谈统一. 《人民文摘》. 人民網. 2014-05-01. Barnouin, Barbara and Yu Changgen. Zhou Enlai: A Political Life. Hong Kong: Chinese University of Hong Kong, 2006. ISBN 978-962-996-280-7. Retrieved at Zhou Enlai: A Political Life on March 12, 2011. Gillin, Donald G. Warlord: Yen Hsi-shan in Shansi Province 1911-1949. Princeton, New Jersey: Princeton University Press. 1967. Li Zongren, Li Tsung-jen, Tong Te-kong. The memoirs of Li Tsung-jen. Boulder, Colo.: Westview Press. 1979. ISBN 978-0-89158-343-1. Spence, Jonathan D. The Search for Modern China, W.W. Norton and Company. 1999. ISBN 978-0-393-97351-8. "CHINA: Return of the Gimo". TIME Magazine. Monday, Mar. 13, 1950. Retrieved at CHINA: Return of the Gimo - TIME on May 16, 2011.